With the important exception of cockroaches, most household and pantry pests do not pose a direct health threat to humans. However, these pests do contaminate large quantities of food, drugs and other organic products, costing Americans millions of dollars each year. While these pests may be a minor annoyance in homes, they can be a serious problem in food processing and storage facilities, as well as groceries and restaurants. Prevention is the best way to stop these pests from invading your home or business. Good sanitation practices, storing food in containers with tightly-fitting lids, removing sheltering debris from around buildings and regularly scheduled exterior and interior pest control are the most effective ways to keep household and pantry pests from becoming a problem. Effective elimination of household and pantry pests at your home or business requires the expertise of a pest control professional with demonstrated experience in pantry and household insect extermination. Allison Pest Control professionals have the knowledge, expertise and experience to locate and destroy dangerous household and pantry pests while maintaining the safety of your family or customers and employees. Allison Pest Control's residential and commercial pest control plans can rid your home or business of dangerous household and pantry insects and prevent them from coming back. Carpet Beetle. Several species of carpet beetles are persistent household pests in New Jersey. The most common and destructive of these oval, 3/8-inch long, stored products pests is the black carpet beetle which is completely black. Other carpet beetle species, including slightly smaller spotted and varied carpet beetles, are covered in mottled brown, orange and white scales giving them a spotted appearance. 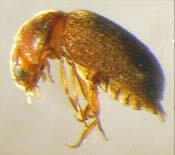 Carpet beetles feed on a variety of dried animal and plant products including wool carpets, wood products, furs, hides, feathers, hair and silk and may also eat soiled linen, cotton and rayon. These destructive pests can damage stored fabrics, clothing and furniture and pose a serious threat to taxidermy and exhibit pieces if they invade museums. Voracious stored product pests, carpet beetles eat cereal, stored grain, nuts, meal and maize used for animal fodder. Carpet beetles do not live in their food sources but crawl about, quickly spreading infestations. Cockroaches. Black to reddish brown with flat, oval bodies, long antennae and spiny legs, cockroaches are known disease vectors. Fouling surfaces and food supplies, cockroaches spread 33 types of bacteria including Salmonella and dysentery, six species of parasitic worms, seven other human pathogens and are a significant cause of allergies, asthma and pulmonary disease, particularly in children and the elderly. 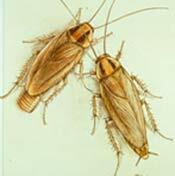 Persistent pests in both residential and commercial environments, the German Cockroach, American Cockroach and Oriental Cockroach are the three most common roaches found in New Jersey. The most common U.S. roach, the 1/2-inch long German cockroach is brown and marked by two darker, longitudinal stripes on the back of its head. Most often found in kitchens and bathrooms, it prefers warm, humid environments. The shiny black Oriental cockroach is 1 inch long, wingless and usually seen in basements and crawl spaces. This roach usually inhabits sewers and culverts but will also live outdoors in leaf litter, stacked firewood or sheds, entering buildings via floor drains to escape winter cold. The largest roach species in New Jersey, the 2-inch long American cockroach bears a pale yellow figure-8 on its back and can be found in both food preparation areas and warm, damp places like sewers and basements. A particularly aggressive roach, the American roach is more likely to forage in daylight than other species. Primarily nocturnal scavengers, daytime activity indicates a serious infestation. Cockroaches feed on nearly anything humans eat or consume. Attracted by food, garbage, clutter and yard debris, these problematic household pests enter buildings by crawling under doors, up sewer pipes, along overhanging shrubbery and tree branches and are often brought indoors in boxes or palletted goods. Cockroaches harbor in dark cracks and crevices near food and water supplies and may build large nests under sinks, in wall voids or crawl spaces or under appliances. Earwigs. These 1-inch long dark brown garden scavengers have flattened bodies and fierce-looking curved pincers at the end of their abdomen. The insects' name comes from an old European superstition that earwigs could enter through the ears during sleep and bore into a person's brain. The legend is completely false; an earwig's pincers are used for defense and courtship and are harmless to humans. Most active at night, earwigs are attracted to bright lights in large numbers. These insects live outdoors in garden mulch and compost piles or under rocks and debris and only enter buildings inadvertently. Earwigs feed primarily on decaying organic material like mulch and dead insects but will also eat green plants and can be a considerable greenhouse and agricultural crop pest. Silverfish. Silvery gray and wingless, these 1/2- to 1-inch long soft-bodied insects are distinguishable by their two overlong, hair-like antennae and the three long filaments nearly as long as their body that protrude from the end of their abdomen. Most active at night, these swift-running insects are often seen darting across bathroom, kitchen and laundry walls or ceilings and can become trapped in sinks or bathtubs, unable to climb their steep, smooth sides. Outdoors, silverfish feed on plants high in carbohydrates and live under rocks, bark, mulch and leaf mold. They are also frequent inhabitants of bird, ant, termite and mammal nests. When these frequent building invaders come indoors, they feed on wallpaper paste, box glue, flour, paper sizing, laundry starch, sugar, cereal and fabrics like cotton, linen, rayon and silk. Silverfish are attracted to damp, dark spaces and will harbor in wall voids, attics, crawl spaces and behind baseboards and window frames. In newly constructed buildings, silverfish may congregate in large numbers on damp, newly-plastered walls; however, a low reproductive rate and slow development make it more likely that single individuals of this household pest will be periodically sighted. Confused Flour Beetle. Reddish brown and about 1/8 inch long, the confused flour beetle has a flat, oblong body that allows it to easily work its way into any food package. Unable to attack whole grains, these scavengers prefer to feed on flour and flour by-products and are a common pest in processed grains. Confused flour beetles are so named because they are often confused with the nearly identical red flour beetle. However, unlike its cousin, the confused flour beetle cannot fly. While they pose no health threat to humans, confused flour beetles damage food supplies, laying their eggs in grain flours, cake and bread mixes, cookies, even chocolate. When infestations are present, confused flour beetles at all stages of development will be present in food stuffs. In heated buildings, these pantry pests breed year round. Drugstore Beetle. Also known as the cigarette beetle and bread beetle, this tiny 1/10 inch long pantry pest is named for the many products it frequently infests. 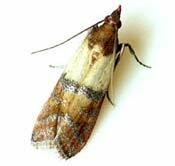 Oval-shaped and dark red to brown, the head of this pantry pest is not visible when viewed from above. Nocturnal, the drugstore beetle is a good flier that lives, feeds and reproduces in nearly any dried, food-based material, including drugs and many drugstore products, cereal, spices, bread, dry pet food and tobacco. The drugstore beetle is also known to feed on book bindings and can cause severe damage if it invades libraries. While not a health threat, drugstore beetles contaminate drug and food supplies. Indian Meal Moth. Small moths up to 5/8 inch long with reddish copper markings at the tips of otherwise white wings, Indian meal moths get their name from their appetite for corn mean, also known as Indian meal. Problem pests in all phases of the food processing chain, Indian meal moths feed on dried plant products, including grains, flour, cereal, nuts, beans, dried fruit, birdseed, dried pet food, spices and potpourri. A common pantry pest in homes and commercial dry food storage facilities, the Indian meal moth lays its eggs in food products to provide larvae with an immediate food source. Larvae spin silken webs around food, rendering it unusable. Most active after dark, Indian meal moths are weak fliers and may be seen resting on ceilings or walls near infested foodstuffs. Like many other pantry pests, Indian meal moths spoil significant quantities of food but do not pose a threat to human health. Rice Weevil. Also known as "snout weevils," this thick-bodied, 1/8-inch long, dark brown pantry pest has four barely visible orange patches on its wings and a distinctive long, thin "snout" used to penetrate whole kernel grains including rice, wheat, corn and barley. Using its snout to punch a hole in the grain kernel, rice weevils lay a single egg inside. Larvae hollow out the kernel as they feed before emerging as adults. Common pests in grain storage facilities and processing plants, rice weevils may also infest homes where they are usually found in cereals, beans, bird seed and nuts but may also attack decorative Indian corn and shadow boxes containing seeds. While not a human health threat, rice weevils damage more stored whole grains worldwide than any other insect pest. Sawtooth Grain Beetle. These minute 1/10-inch rusty-brown beetles are very flat and narrow, allowing them to easily gain access to most packaged foodstuffs. Sawtooth grain beetles do not attack whole grains but feed on rice, oat and other cereal grains and flours, as well as dried fruit, dry pet foods, pasta and chocolate. Like many pantry pests, sawtooth grain beetles live and reproduce in the food products they eat. While they pose no human health threat, sawtooth grain beetles are prolific reproducers, quickly establishing large populations that can spread quickly through groceries, pantries, food processing plants and warehouses, contaminating food products.